All Versatile Farm Makes it 100,000! 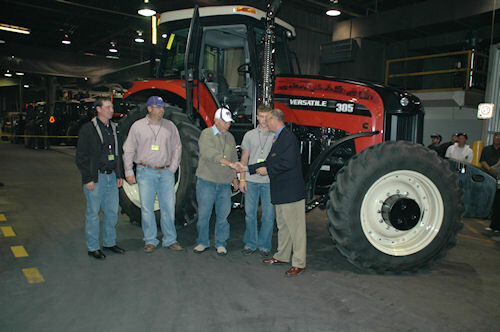 Kansas diversified farm family purchases milestone Versatile 305 row crop machine. Farming since 1987, Rod Bracelin says he's had 22 Versatile tractors, and when his dealer called about a month ago and asked if he wanted to buy the 100,000TH unit to roll off the line in Winnipeg, he said, "Sure!" Bracelin, his son Rodney and Grandson Cade, were on hand Wednesday to take the keys from Versatile's Sales director Darrell Steiner at the end of the Canadian assembly line that has produced Versatile tractos in a variety of colors since 1966. The three-generations of Bracelins farm about 2,000 acres of wheat, dryland and irrigated corn, grain sorghum , and run about 600 stocker cattle a year. Darrell Steiner, Sales Director for Versatile, hands the keys to Rod Bracelin, St. Francis, Kan., during ceremonies at Versatile's factory in Winnipeg, Can. Others in the photo include, from left, Jon Yost, Yost Farm Supply (dealer), Goodland, Kan., Rodney Bracelin and Cade Bracelin. "I've bought Versatile tractors the whole time, of course my son was a dealer during some of that era," Rod says, but notes he's very proud to own the milestone unit – complete with hood decals featuring all of the models of Versatile machines since 1966. The chrome steps and exhaust shrouds also add to the striking appearance of the new 305. Versatile officials plan to use the machine in a variety of promotional events this winter, but Bracelin will take full ownership of the machine in March.